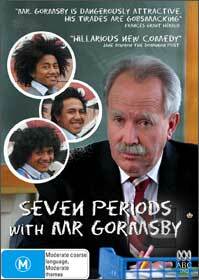 Mr Gormsby is the antithesis of politically correct. A crabby sexist, racist character, Mr. Gormsby is a teacher in a school who would like nothing better than to get rid of him. Taking place in New Zealand in a made up school, quite frankly I found this show to be quite off putting. Don’t get me wrong, I’ll watch and enjoy just about anything but racism as humour in my opinion is not funny and no matter how objective I’ll try to be I simply won’t tolerate it as humour any day, no sir. Bawdy humour, sure, grumpy nasty people, I’m there with a laugh and while I am sure that this is social satire and I know that there are people like that everywhere, I just couldn’t warm to the character or the show. Whilst I know that the laugh is meant to be at Gormsby, much the same as the laughter was meant to be directed at Ted Bullpit in Kingswood Country, it wasn’t funny then to me and this is not funny now. Give it a miss unless you are at the bottom of the barrel with this show.